By your request, our first zoom meeting will be taking place April 16. In order to make this meeting a success and of benefit to you, we ask that you please provide us with topics that you are looking to discuss. Please take a few minutes to send some topics for consideration to Joan. Terry Elton of the Small Business Growth Partners will be our facilitator and brings over a decade of business coaching experience. Please be prepared to discuss Sheri Pash as a possible presenter at the EO Summit or a statewide workshop, along with Dean Stewart as moderator. Harvey Kessel plans to discuss a number of topics related to membership. 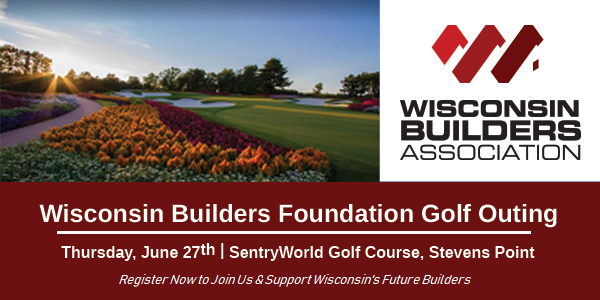 Registration is open for this summer’s June Member Meeting and WB Foundation Golf Outing taking place June 26th and 27th respectively at SentryWorld Golf Course in Stevens Point. Beyond the hyperlinks above, information for each event is also posted on their individual pages on our events site. We plan to send several promotional emails to members, along with social media posts, but would appreciate you working the member meeting and golf outing into your own association’s distributions. Below is a golf outing ad that you can put in your own promotional emails. Please hyperlink the image here. The WBA has heard from some members that some municipalities have been requiring them to submit both paper and online permit forms for the same new home building permit. For those of you who joined us at Advocacy Day or may have read in recent communications from us, there is currently pending legislation that would streamline the building permit application process and would prohibit a municipality from requiring an applicant to submit the application both via paper and electronically. We have received a handful of responses, but are looking to hear from additional members on which municipalities they have worked with that have required both application forms, and would like to ask for your help in doing so. Please use this link to promote our survey which will be open through April 1 and help us help our members! The application deadline for scholarships is May 15th. Please encourage students you know who are interested in pursuing an education in trades to use this link to apply. The scholarship awards ceremony will take place during the Board of Directors meeting on June 26th. The WBA is working with Sortis Marketing on membership recruitment initiatives, including updating our Join Now page. We will be working with Sortis on engaging new content as well as streamlined application capabilities in collaboration with your local associations and NAHB. Our goal is to have all updates launched by mid-summer. We will be in communication with more information as we move forward through this process, so stay tuned! Don’t forget! The WB Foundation has raffle tickets for sale! Only 250 tickets were printed and drawing will occur at the golf outing in June. Please promote this in your newsletters and at member meetings. Contact Joan for more information or if you have members willing to help sell tickets. For nearly 25 years, the Employer Group has been partnering with clients across Wisconsin, including the Wisconsin Builders Association, to provide human resources services. Their services are now available for local associations. Please click here for more information! In case you missed it, the March advocacy digest has been posted on the Executive Officer Resources page!